So you want a gaming keyboard that is actually going to make you a better player. I do understand, you know. You don’t want to be cannon fodder for the pro gamers anymore, do you? I don’t blame you. Who wants to be shot in the head multiple times a day? I Know I don’t want to be. But don’t worry for these keyboards will transform you from noob to ninja in no time at all. The great thing about the keyboards I looked at is, they come in all different shapes and sizes, colors and lighting setups. There really is something for everybody here. You can get some amazing ones for well under $50 dollars that will do everything you could ever dream of a keyboard doing for you. (Whow, steady on there!) Keyboards that will only be marginally inferior to the setups pro’s use. So save yourself some cash and use it for a victory beer after you win! Yes you could argue, and I knew you would, that more expensive keyboards will have more features or, as I like to call them, gimmicks. And they are nice to have. Yes I’m a sucker for gimmicks. I got a Nintendo Wii on day one and loved it! But thats all they are, gimmicks to draw you in so you part with a wod of cash. Be smart people. You can have some sweet keyboard action for little more than the price of a meal. So, lets take a look at what I consider the best gaming keyboards for under $50 and start your gaming revolution today. Ok, first something a little different. How about keyboard that is so white,so devoid of colour that if you dropped it in snow, you would loose it? Now, has everybody reading this started nodding their heads in approval thinking, ‘Ow yes, that’s exactly what I need.’ If so, and you really should, read on and be dazzled Havit’s white wonder. Outside of being completely White, the Havit offers up surprisingly good build quality throughout its construction along with a number of aesthetic perks that will draw you in. Again, just in case you didn’t get it, its white. White body and white keys. What other keyboard can say that? To contrast this fluffy cloud appearance (I couldn’t think of anything else white at the time… A rabbit?? ), Havit have offered up a rainbow LED light setup under the keys. It looks, surprisingly, rather cool in person. Because, to be honest, I thought it was going to look purity crap. And if your heart so desires the variation, these lights can be set to 4 different lighting variations. These include: High, which makes your eyes bleed. Medium which is right for purity much everybody. Low, which is completely invisible and drowned out by the glare of the white. And pulling which will make your eyes bleed and your head pop off. There is a fifth, hidden variation… You can turn them off. Great. The one negative about the keyboard isn’t actually a problem with the keyboard itself but the fact that a mouse was forced on you as part of the deal. Like when you get a hot new girlfriend/boyfriend and their ugly best friend came as part of the package. I can’t help but think that PC gaming people buy their mice and keyboards separately. So why throw in an afterthought of a mouse that is just going to raise the price? Overall from a design point of view the Havit really stands out and if you are the type to say, ‘look what I’ve got,’ then you will love it. As for the usability and feel you can immediately tell that all the money has gone into the looks of the thing and nothing else. Don’t misunderstand me, it’s a fantastic non mechanical keyboard that is leaps ahead of any pack in garbage you can get, but you can feel that the aesthetically pleased among you was the target market here. The key pressing does feel good and responsive and the keyboard comes with anti-ghosting technology, which is the ability to press as many keys as you want simultaneously without the keyboard blowing up. I was hard pressed to find other usability features, though I did tease out a few details in regards to interchangeable WASD keys and that you can turn off the stupid Windows Key. And thats it, not much else, From a usability point of view, the Havit is very lite on features. But, If you want a keyboard that stands out from the crowed and is different, then you really wont find another keyboard at this price point that is going to come close to the Havit. With its slick white lines and multi hued LED system, anybody who looks at it is going to ask, ‘ where did you get that? It’s so cool!’ And admit it, your ego would love that! Lets welcome are first true contender for the best gaming keyboard under $50: The Sades k10. A great little keyboard that looks as good as it feels with full mechanical keys available for your personal gaming pleasure. First of all, and this is a personal opinion, I think this is a stunning keyboard that comes in a tantalizingly small package. Like all 5 foot 6 of me. As soon as you lay your eyes on the K10 you will want it. It oozes class. On the upper of its body it has a full, Gold colored, plastic body that is housed in an embracing lower metal case that provides added rigidity and protection. Which is great, because you know eventually, as we all do, you will throw it in a fit of anger when you get shot, stabbed, stealth killed, overtaken or whatever other game death you regularly partake in. Along with this fancy shell you get a full color light array which looks cool almost like some dug infused 60’s camper van turned inside out. I mean, come on, just look at the picture. Ok, the light comes from the underneath the keys but remember your not paying $150 for this thing. And one last thing about its design. Even though it is incredibly small, its actually a full size keyboard. So you have stand out looks and a full size keyboard to be playing around with. But how does it feel. Fortunately the feel of the typing experience is great. This is the first keyboard we are looking at that has a full set of mechanical keys to give you a real, solid tactile response with each press. The mechanism in use is not a cherry system but a custom build that is the equivalent of the cherry MX Blue. So you get a key that needs medium pressure to activate and as a result of your finger tickling the it down, you get a suitably delicious click sound each and every time. Every depression of a key giving you a real advantage in gaming as it is an extra bit of feedback that can used as an audible cue. Simply put, you would never have found a keyboard like this, with its mechanical feedback system at this price point, as little as 2 years ago. We are talking about near pro gaming levels of performance here. So there we are. The Sades marries great looks with even better feedback that puts your average spongy, throw-away, pack in HP (I hate HP) keyboard to shame. If you are looking for a gaming keyboard, make sure you give this slim and fit bad boy a look. You wont be disappointed. 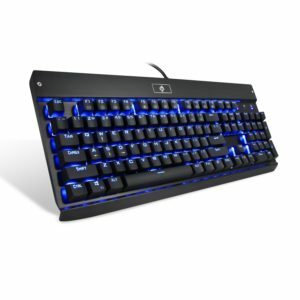 All black and with sweat blue LED lighting, the EagleTec KG010 mechanical keyboard will give you the feedback you need to up the level up your skills. The first thing you are going to notice about the Eagle is its simplicity. I mean, the only thing that isn’t black plastic on this thing is the key symbols and a bit of blue LED lighting around the edges. It looks as uncreative as the best of Microsoft’s efforts. The closes thing I can think of to compare it to is brick. If you painted it black and minus the weight. The Eagle does do one thing extremely well: It has precision tactile mechanical mechanisms under every key and you will be loving it. Yes, for looks, it could win awards for being the blandest peace of plastic on earth. But, for feel, this is a rather surprising lump of plastic. The eagle Provides a rip off of the acclaimed cherry MX blue mechanical actuator. What does this mean in plain English though? Well basicly it means that you get a nice bit of travel and resistance on the key press along with a little bump to let you know you have pressed it, finishing off with a crisp and cute little click sound. Feedback for the finger and the ear that will add immeasurably to your in game control. The EagleTec is saved from the bins of mediocrity by offering up almost class leading feedback and finger singing control. If you don’t mind bland looks the EagleTec could be the keyboard for you. 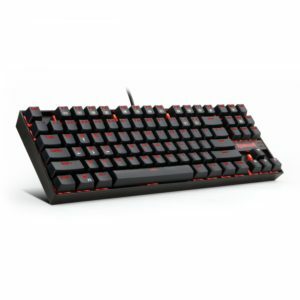 The Redragon Kumara (nice name, sounds like a cat) is the first keyboard here that really is closing in on the high end Gaming keyboards that would usually cost well over $150. If you want a keyboard that can compete with the best without having to sell off a kidney in a dark alley, the Kumara is the one to look at. Understated brilliance. Thats the first thing I thought the first time I saw, and subsequently used, the ‘Ragon keyboard. Its a tiny Keyboard, not fully laden with a number pad but it feels and looks like it should be in a fighter jet cockpit. Its black angular lines punctuated with red LDE lighting, Redragon effort is simple and that’s a beautiful thing. You only get exactly what you need. Though you do get one welcome extra. It’s waterproof so if you have any ‘accidents,’ it wont just die on you mid game. It’s made mostly of metal so its heard wearing and can take a beating. This is the little keyboard that can… and will. Under those understated look beats the heart of champion gaming keyboard. The Kumara is one of the few gaming keyboards that comes with it’s own customer version of the cherry green mechanical actuator. What does this mean for you though. Well, the green actuator is nearly exactly the same as the blue actuator. The same tactile bump to let you know its been pressed. The same satisfying click at the end. But there is one difference and that is the green mechanism is stiffer to press and takes more effort to push down. This apparently leads to less mistakes being made when playing games. Maybe I’m just a little heavy handed, but I can personally vouch for this when I have used this keyboard in game. Yes I might be a little biased but get this know people, it’s amazing. It feel like Redragon has gone and said, ‘Here you go gamers. We made a $150 keyboard and we want to sell it to you for $40. Don’t worry, we will pay the difference.’ You need to follow the link and buy one right now. Because, wow, this keyboard is amazing for the price. The Tomoko may sacrifice good looks but it offers up the best tactile experience of any keyboard listed here. It’s the one you definitely need to take a look at. The Tomoko 87 is, I must admit, very basic looking. But like the girl next door (admit it, you looked!) appearances can be very, very deceiving. The design is basic. Its not a full keyboard which makes it conveniently small and light. It has no extra features or buttons. It has no LED what so ever. But Do you really need them? If you have to look down at your keyboard to find the keys you not winning tournaments anytime soon. And there is not even a light underneath the Tomoko logo. How modest of them. It is however, pretty much water proof. A running theme is keyboards these days it seems. It even comes with a couple a drainage holes at the bottom of the all metal chassis to help drain away unwanted fluid. The keyboard has also been designed to be ergonomic in shape so as to save you wrists from stress related fatigue. As if a keyboard is going to be the reason for that! But seriously, if basic doesn’t bother you then underneath is a real gem to be had. Peel away all that black plastic and you will see the glimpse of a jewel hidden in mechanical magnificence. Because, for feel this is probably the best keyboard, at this price point, that I have looked at. It just feels so right to use. You know the feeling when you slip on your favourite teams jersey on before a big game. 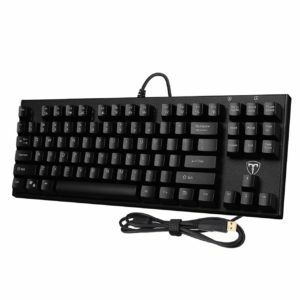 The Tomoko is the only Keyboard on this list that uses True Cherry MX Blue Mechanical switches. In fact, I believe that it maybe the only keyboard anywhere, ever to have Cherry blues at this amazing price. But your wrong. The cherry Blue offers up such detail in the tactile response it feels like your pocking your finger into… Well I shall stop there. Each actuator needs as little as 60 grams of pressure to activate. Stiff enough to avoid mistakes but easy enough to move so as to double tap. And with the Blue you get that scrumptious activation bump followed by the fully pressed click. Music to the ears and a mechanical massage for the finger tips. It has, simply put, stunning feedback. This is a $150 keyboard in under $50 clothing. Stunning achievement by TOMOKO, yes they made some aesthetic sacrifices but they are worth it in every way. 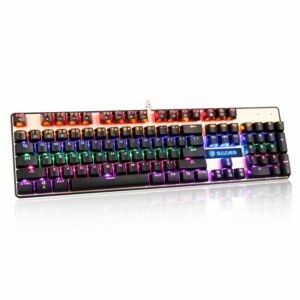 I may prefer the Redragon, but If you get this keyboard not only will you save your self $100 over getting a top brand. 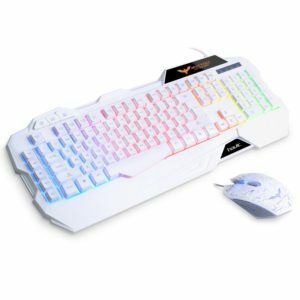 You will be getting one of the best keyboards for gaming on the market at this price point. A must buy. Looking for a VR Premium VR headset that wont empty your wallet? Look no more my friend as our handy guide to the Best VR headsets under $100 has got you covered! I’ve been lucky enough to be part of the gaming industry for nearly 8 years, and in all that time, I have never seen anything that has generated such interest, such pure excitement as VR. 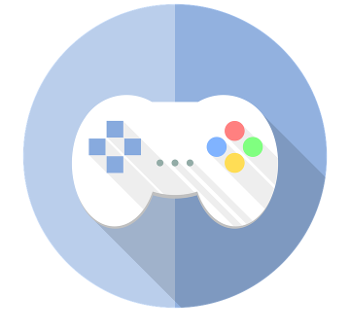 For the first time, we can go beyond the TV and break down the traditional walls of games. We can talk about the immersion of games such as Uncharted or Call of Duty, but your not really there, you don’t feel part of the experience, its a kind of a ‘sudo’ immersion. Your just sat there, controller in hand, popping your enemies’ heads off! But, VR changes all of that. It thrusts you in, bullets flying past your ears, jumps and falls that make you reach out, desperately trying cling on to anything your hands can reach. You will stare up buildings that look a mile high. And extend a finger to tickle a solitary leaf that’s no more tangible than the air we breath. You lose yourself in VR. You are the game, the character and the world. This is a technology that makes the unreal feel real. However, being such a young technology, this digital revolution is not going to come cheap. To experience VR at its very best you are looking at spending sums of money that would buy you a very small house! So not exactly a cheap hobby then. If you want in on this VR world, you are going to have to dig deep into your pockets… Very deep. But, what if I told you that, for a fraction of the cost of this hypothetical, very small house, you can have a premium VR experience right now. A VR experience that has no wires, no bulky PCs, and most importantly, no debt collectors at your front door. Interested? Well, for under $100 there are fantastic VR headsets to be had that will make the $25 headsets look like old, tattered paper 3d glasses. So read on to find are top picks for the best VR headsets under $100 that will give you a great experience without breaking the bank. 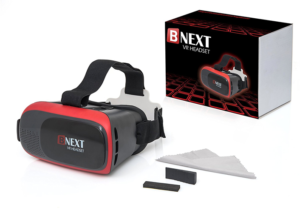 So, first up we have the Bnext headset and immediately you get a feeling of quality that was no present in the $25 headset. We have definitely entered the big league. You now getting a Premium headset that will enhance your VR experience in every way. So, lets take a look at the key difference between the Bnext and its competition. The stand out characteristic that sets the Bnext apart has to be the advanced resin lenses that are housed inside its blue and red body. These optical wonders not only offer up a crystal clear image, but include proprietary technology that has not been seen in other headsets up-to this point. The lenses have a unique, state of the art build method, the Bnext manages to somehow include a blue light filter to decrease fatigue while increasing the all important viewing angle. Additionally, these Resin lens have key customisation options including Focal and pupil distance adjustment. Key for all users both glasses and non glasses wearers alike. So there you have it, if you want, at a reasonable price, some of the most advanced optics in gaming strapped to your eyeballs, the Bnext is going to be the headset for you. 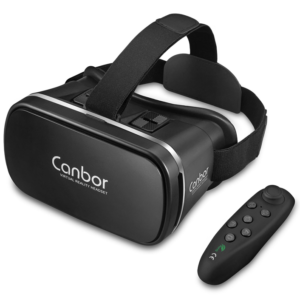 The Canbor VR is another premium headset that looks to offer a unique feature set for a little bit more of your money. Boasting Increased options and user tweak-ability its could be the headset to propel you into the VR stratosphere. Though the Canbor boasts all the premium features you would expect of a headset for this price, there is one stand out feature that grabbed my attention and wouldn’t let it go. You see, the first thing that strikes you about the Canbor apart from its undoubted luxurious feel, is its almost human need to impress and caress you. And it does this all in a very impressive, very echo friendly,’ we use recycled plastic way,’ way. But, in a completely contrary, anti eco earth move, they even went out, killed a cow, and strapped its leather hide to the headset for your optimal, face hugging pleasure.. No doubt, green peace, in all their tree hugging wisdom, will be very pleased by this use of our bovine friends. If you want extremely high build quality that marries extreme comfort that only a cow can offer, the Canbor is the headset for you. The Samsung Gear VR headset is probably one of the best headsets out side of the big 3 of Vive Oculus and PSVR. So lets take a look at one of the key design points that makes this sub $100 headset punch above its weight. So what makes this headset stand out from the crowd. Well, it simply has to be the lenses that are housed inside its tiny black and white body. The Gear VR, inexplicably for this price point, has 2 Oculus rift lenses. Not some shoddy knock off that is going to give you a bad case of sea sickness. These are the real deal. For less than $100 you can have lenses that come strait from a headset that costs more than 5 times that amount! I don’t know how Samsung did this, but, I suspect that a Korean version of a ninja may have been sent to Oculus Towers, knife in hand, to do some aggressive negotiating. And it paid off. Ether way, the Samsung scores one of the biggest goals in cheap VR with the inclusion of Oculus specks and you would, quit simply, be mad to miss out on a pair. 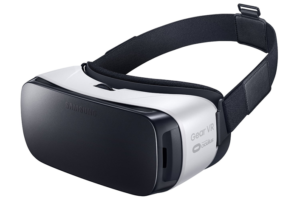 But hang on… Hasn’t Samsung just brought out a brand new Gear VR headset? Indeed, yes they have and the Korean Giant has hit the ball right out of the park with this one. I mean way out. What could they have possibly improved to beat out the already impressive Gear VR version 1? Having already housed the best optics in the game, I find it hard to figure out exactly how Samsung could have made the Gear VR any better. Because, come on, it’s sub $100 perfection. Yet, this new Gear VR Proves that the original was not perfection at all. It was a mere illusion, created by Samsung so the could swoop in and show us an even more mesmerising VR experience. For you see, the first, though impressive for the time, only had a 90 degree viewing angle. This new VR experience has an industry leading, wait for it, 110 degree viewing angle. I mean come on, that’s the same as the $550 Oculus and only 5 degrees less than the $750 HTC Vive. How did they do this? What alien race have they bribed to get this technology? We may never know, but what I do know is this: It is the most advanced headset you can get for $100 or less and it almost, almost makes you think what would be the point in getting an Oculus, a HTC or anything else for that matter. This headset is class leading and if you want the best experience outside of the super expensive VR titans, then this is it. 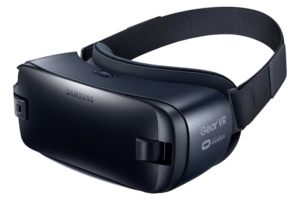 So how do you compete with a headset such as the perfect technological miracle that is the Gear VR? Simple answer, you make your headset completely indestructible… and you paint it purple. VR is cool. I want to play, you want to play, your Gran wants to play, but, most of all, loads of kids want to play. You don’t want a load of kids touching up your shiny new Samsung Gear VR do you. You don’t want their sticky, chocolate covered, dirt ridden fingers all over your lens right? Of course you don’t! And that’s where the Merge VR comes into play. This headset, apart from being made in a bright purple colour to attract the adolescent, is essentially indestructible. The Merge is made from material that, as far as I can tell, breaks all the known laws of physics. You can throw it at a wall, it wont break. You can get 2 kids to pull it apart, it will stretch then bounce back. These headsets are so unbreakable I am genuinely surprised NASA hasn’t bought a load of them to use as heat shielding on there rockets! 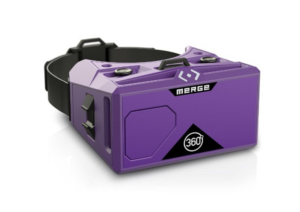 So if your lucky, or unlucky, enough to have a load of kids in your life, the Merge VR is the headset to keep them busy so you can rest worry free knowing that no-matter what they do, they wont go and break the thing.